tri this short fragment of Valentinus's teaching, as reported bv Clement of Alexandria, che Gnostic Christian philosopher Iiis concerns about the problem oí visual representation between general statements about artistic verisimilitude and the impossibility of producing ;l true likeness comparing Mil- Lnadequac es of human ort ir h God's creation of Adam in the image and likeness, thus making a "credible portrait''of a certain kind. * Christian visual art, at least un a pai with narrative i gery. 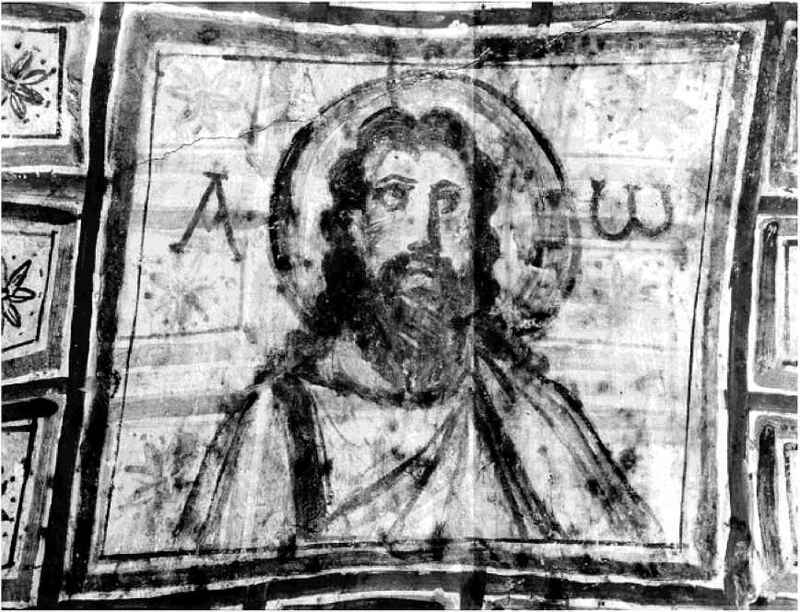 We must j^k whin theological, culinr.il, or artistic forces were responsible lor Mm important Iraniilion in the composition of Christian iconography. Ftg. 12. 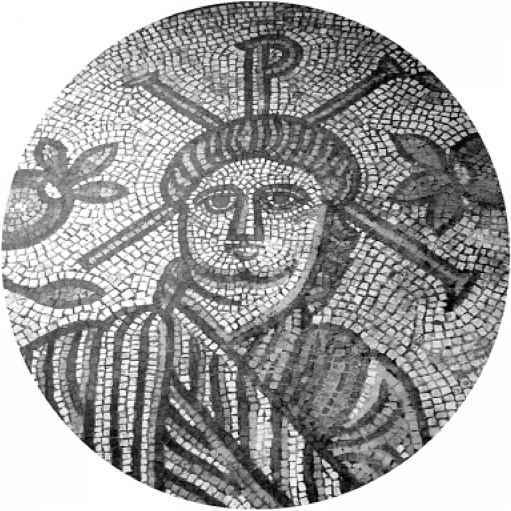 Mosaic Portrait of Christ from Rorr-an Villa at Hinton St Mary; Dorset lal€ 4lh cen-Ci.. London, British Museum (PhotocAuthor). 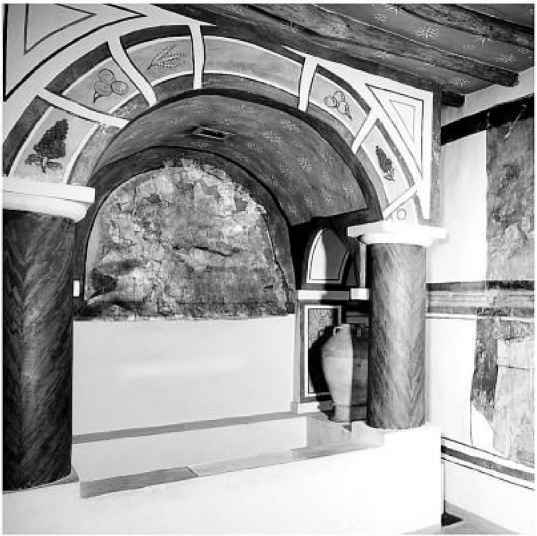 A statuette, now assumed to be a portrait of Christ seated and holding a scroll, was discovered in Asia Minor and is now housed in Rome's Museo Nazi on ale (fig. 13). The work generally has been dated to the late fourth century, although both its date and its identification as an image of Christ have been questioned/5 The beardless, youthful, and almost feminine appearance of the figure has recently been discussed in some detail and certainly offers contrast with the images from Commodilla and Ostia in particular.76 The figure in this case bears more resemblance to the figure of Christ on mid-fourth century sarcophagi, including the tomb of Junius Bassus, now in the Vatican (fig. 14). Although the original context of this statuette is unknown, it appears to have been designed to be an independent work of art, not a part of a group or larger composition. the beginning of the eighth century and the outbreak of iconoclasm, portraits of the saints, Mary, and even Christ were hardly a matter for concern. Fig. 14. 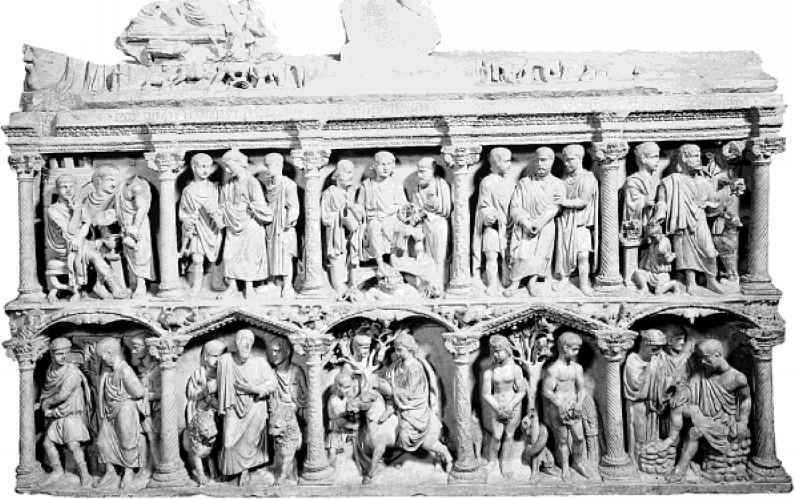 Sarcophagus of Junius Bassus, 357 C.E., Treasury of" St. Peter's Basilica, Rome (Photo; Scala/Art Resource, NY). that portraits of the saints, Mary, or Christ had arrived, al least tine provincial but famous bishop at the turn of the fifth century was worried about how the existence and popularity of such images still might lead his congregation astray. Noting that some of the better educated pagans in his city had turned the tables and actually were chiding Christians for being "adorers of columns, and sometimes even of pictures" Augustine grants that such things are taking place ("would to God that we didn't have them") and notes that the practice is defended by what will become Lhe standard Christian agument: '"We/ they say, 'donbt adore images, but what is signified by the image. '"77 Augustine objects to such an argument by pointing out that it would be wise]" to pray directly to the saint rather than to the image of that saint, an argument that might seem eminently sensible if posed to a congregation that was unattached to such visual and material aids to prayer. Whether his congregation was persuaded or not (we have no surviving icons from Hippo) is ultimately less interesting, however, than the fact that, according to Augustine, Christians are being accused of the very acts their authorities had formerly ridiculed in others.